An Evaporative Swamp Cooler (also called a 'desert cooler' or a 'wet air cooler') is a HVAC system that provides cool air to your home by a process that involves the evaporation of water. Evaporative Swamp Coolers require a water source, and must continually consume water to operate. But they are more energy efficient than other types of air conditioning systems, because they create cooling from water evaporation, rather than running a refrigeration cycle. Evaporative Swamp Coolers are especially well-suited for climates where the outside air is hot and the relative humidity is low. 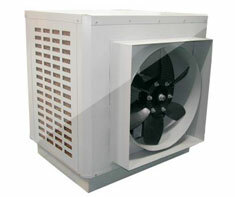 Shown in the 'Routine Care' section are the recommended routine maintenance tasks for your evaporative (swamp) cooler. The 'Q & A' section shows answers to common questions. And the 'Articles' section provides helpful articles about your evaporative (swamp) cooler.